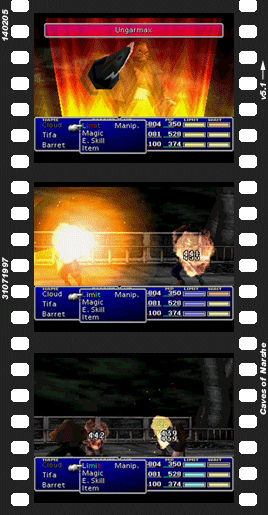 Final Fantasy VII was the first in the series to have true Limit Breaks. 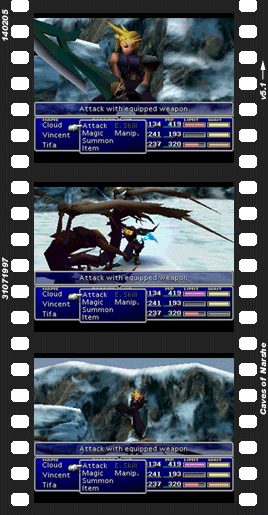 While VI debuted the concept with its desperation attacks, Final Fantasy VII was the game that really created a “system” first — and, many would say, created the best system yet. 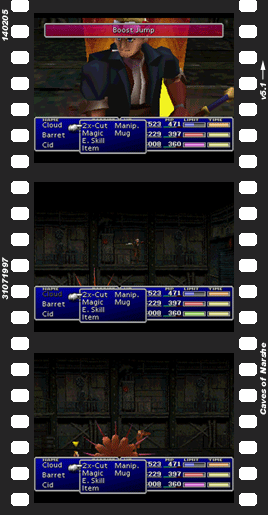 Just another way in which Square broke new ground with this game. 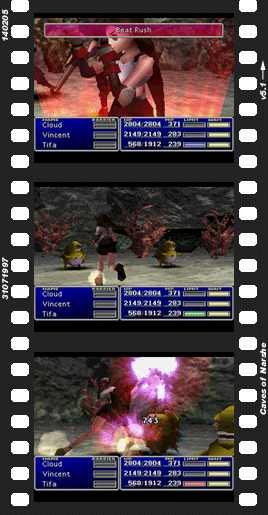 Unlike VI’s desperation attacks or VIII’s version of limits, Final Fantasy VII’s limit breaks aren’t triggered by having few HP: instead, a visible limit bar fills as your character is hit by enemies, and no amount of healing will reduce it. 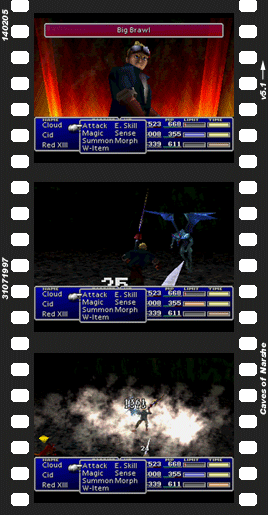 As long as your character doesn’t drop to zero HP, the limit bar’s state will be held across battles until you use a limit break. 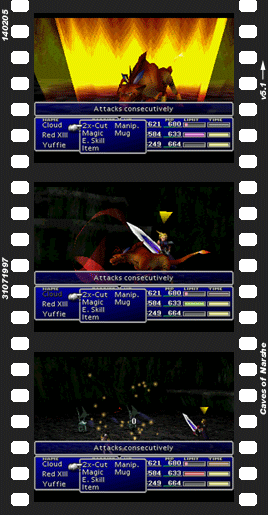 Limits can only be used once the bar is full, at which point the Attack command for that character will change to Limit. Once a limit is used, the same character cannot use another limit until the bar fills up again. 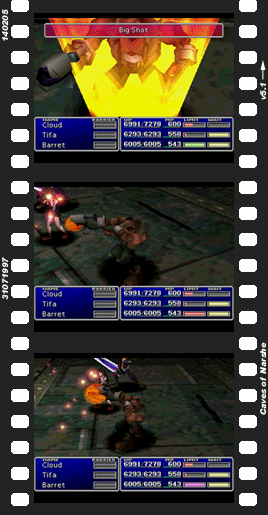 Each character has a unique set of limit breaks; this is one of the few functional differences between Final Fantasy VII’s (and indeed VIII’s) individual characters. Two main situations can affect the rate at which your limit bar increases. The first is the current setting of your limit level. 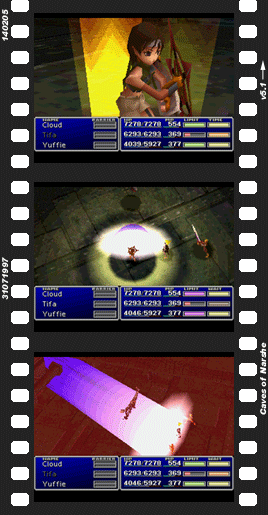 There are four limit levels, each allowing the use of two individual limit skills (with the exception of level four, which contains only one limit, Cait Sith, who only has two limit levels with one skill each, and Vincent, who has only one limit skill on each of his four levels). The limits available at higher levels are orders of magnitude more powerful, but your limit bar fills more slowly when set to higher levels. The limit bar also resets whenever you switch limit level (which cannot be done mid-battle). The second influence on limit rate is the duo of Fury and Sadness statuses. Fury increases the rate at which your limit bar gains, at the cost of physical attacks’ hit rate; Sadness does largely the opposite. Various enemies inflict these statuses; Fury can be cured with a Tranquilizer, and Sadness with a Hyper, but in addition, using either of these items when neither ailment is inflicted will actually cause the opposite status from the one they cure. So if you’re desperate for a limit break, use one of your Hypers. 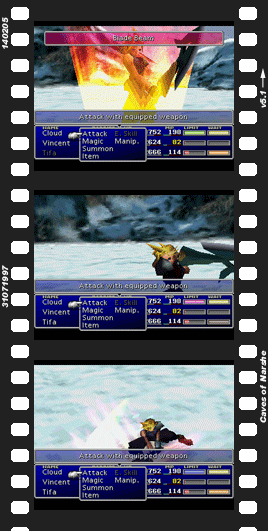 This is an alphabetical list of limit breaks. It’s probably more useful to view them per-character and in the order they’re obtained, though; for that, head over to the characters page. 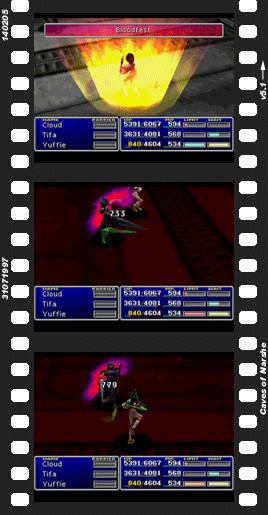 Use the item All Creation after acquiring all of Yuffie’s other limit breaks.